1A. Location cards have a number and a letter in the bottom-left corner. There are eight locations, each of which has both a side A and a side B. Each player takes one of each location card. 1B Arrange your location cards in front of you with side A faceup, in ascending order from left to right. Leave some space below each location to place your character cards. 2A. Shuffle a number of worker cards equal to the number of players (ensuring that the card with the knight is among them) and deal one to each player. Place this card faceup above your location cards. Then, each player places 5 meeples on his or her worker card. The player who has the worker card with the knight is the first player. 3. Your wealth is tracked by chips: 10 1-point chips, 25 2-point chips, 25 10-point chip, 6 50-point chips, 4 100-point chips. Place these chips as a supply within easy reach of all players. 4. Shuffle the tier 2 cards (with red backs ) and place them facedown in a pile in the center of the table. Then, shuffle the tier 1 cards (with green backs ). Using the chart on the right, set aside the number of tier 1 cards listed. Place the set-aside cards on top of the tier 2 cards to create the deck. Return the unused tier 1 cards to the box. Finally, create the character display by placing the top 6 cards of the deck faceup in a row next to the deck. 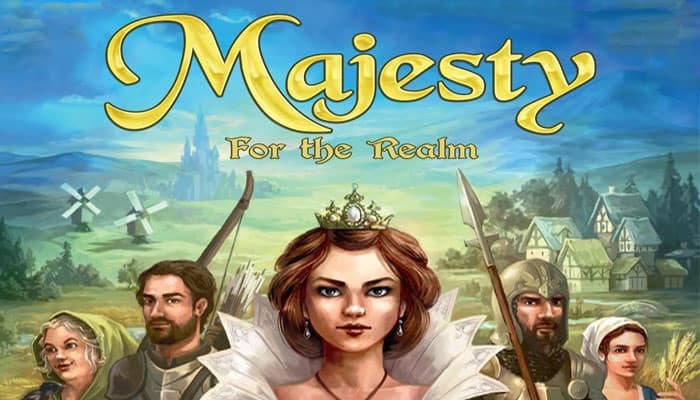 In Majesty: For the Realm , you control your own realm, which consists of the eight different location cards in front of you. Nearby, you and your rivals compete for the loyalty of the people, who will aid you. The goal of the game is to enlist these subjects and to use their skills to bring wealth to your realm. At the end of the game, the player with the most points wins. On your turn, you must take one character from the display and place it at its matching location in your realm. Doing so activates that location, which can result in you gaining points or meeples, attacking other players, or even causing other players to gain points. Then, play proceeds clockwise to the player on your left, who also takes one character from the display, places it in his or her realm, and activates its location. When you gain points, take the appropriate value of chips from the supply. When you lose points, return the appropriate value of chips to the supply. At any time during the game, you can exchange your chips with those of equivalent value from the supply. Play continues as described above until each player has exactly 12 character cards in their realm. At that point, players perform final scoring and compare points. The player with the most points win. At the start of your turn, choose one character card to take from the display. The character card farthest from the deck is in the front space of the display, and the character card nearest to the deck is in the back space. The character card in the front space is always free to take. To take a card in any other space, place one of your meeples on each card, starting with the front space, leading up to your chosen card. You cannot choose a character card if you do not have enough meeples to place one on each card leading up to it. You want to choose the Knight, but you have only two meeples. Instead, you choose to take the Noble. You place one meeple on the Witch, one on the Miller, and take the Noble from the display. The meeples remain on cards in the display until they are taken. You can gain meeples by either taking a card with meeples on it from the display or resolving a location's ability (which is explained on the next page). When you gain meeples, place them in empty spaces on your worker card. If you still have more meeples to place, but there are no more empty spaces available, keep them next to your worker card until the end of the turn. On a later turn, you take the Miller, which has 2 meeples on it. Your worker card has only one empty space. You place one meeple on your worker card, and one next to your worker card. After you take a character card from the display, place it at its matching location. Each character card has an icon in the top-right corner. 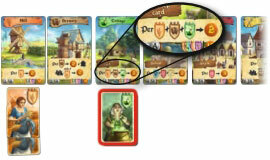 This icon shows where the character is placed and is used by location abilities to reference character cards. When you place your character at its location, activate that location and resolve its abilities. There is no limit to how many characters can be at a location. You can place this split card at either the Brewery as a Brewer or the Cottage as a Witch. Some character cards show two characters, one split on each half of the card. When you take a split card, choose which character to use by placing it with the top character at its matching location. After you place a character at its location, resolve that location's abilities from top to bottom. Abilities typically provide points and/or meeples based on which characters are currently in your realm. Some locations have special abilities written on a signpost, which are explained below. You take a Miller and place it at your Mill. You gain 2 points. On your next turn, you take another Miller. You gain 2 points for each. Then, you take a Witch. You gain 2 points for each Miller, Brewer, and Witch in your realm. Since you have Miller, for a total of 4 points. two Millers and one Witch, you gain 6 points. After you have resolved the location's abilities, your turn ends. If there are any meeples next to your worker card, return them to the supply and gain 1 point for each meeple you return. Then, close the gap in the display. To do this, slide each remaining card one space toward the front space. Then, draw the top character card and place it faceup in the back space. Remember to keep meeples on their cards. Play then proceeds clockwise to the player on your left. Slide each remaining card one space toward the front. Then, place the top card of the character deck faceup in the back space. At the end of your turn, you still have a meeple next to your worker card. You return it to the supply, and gain 1 point. Four locations also have a special ability written on a signpost above their other abilities. When activating a location with a special ability, remember to resolve abilities from top to bottom (meaning to first resolve the special ability, followed by the other abilities on the card). 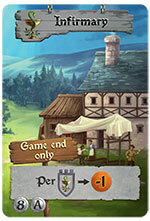 While you have a Guard at the Guardhouse, you can defend against attacks from other players. When you place a Knight at your Barracks, you individually attack each opponent. If an opponent has the same number of Guards or more than you have Knights, your attack fails, and nothing happens. If an opponent has fewer Guards than you have Knights, your attack succeeds. The defender has two Guards, and the attacker has one Knight. This attack fails. The defender has two Guards, and the attacker has three Knights. This attack succeeds. That player moves his or her leftmost character to his or her Infirmary, placing it facedown on top of any other characters already there. For each attack, only one character can be sent to the Infirmary per player. Location abilities do not count characters at the Infirmary. You were attacked, so one of your Brewers is sent to the Infirmary. While at the Infirmary, it does not count when resolving abilities that reference Brewers. When you place a Witch at the Cottage, return the top card from your Infirmary to its matching location, without activating the location. You take a Witch and place it at your Cottage. First, move your Brewer from the Infirmary and return it faceup to the Brewery (THE Brewery does not activate). Then, because you have two Brewers and two Witches, you gain 8 points. When you heal a split card, choose where to place it. Because healing is resolved first, the healed character counts when resolving the rest of the Cottage's abilities. The Infirmary's special ability happens only during final scoring. You do not lose points when placing characters at the Infirmary. For each character in your Infirmary, you lose 1 point. Then return those cards to the box; they are no longer part of your realm. Count the number of your locations that have at least one character. You gain points equal to that number multiplied by itself. Each location card has the full set of icons in the bottom-right as a reminder of this step. You have 12 total characters, but they are only at four different locations. You gain (4 x4 =) 16 points. The Mill's value is 10. You have the most Millers, so you gain 10 points. 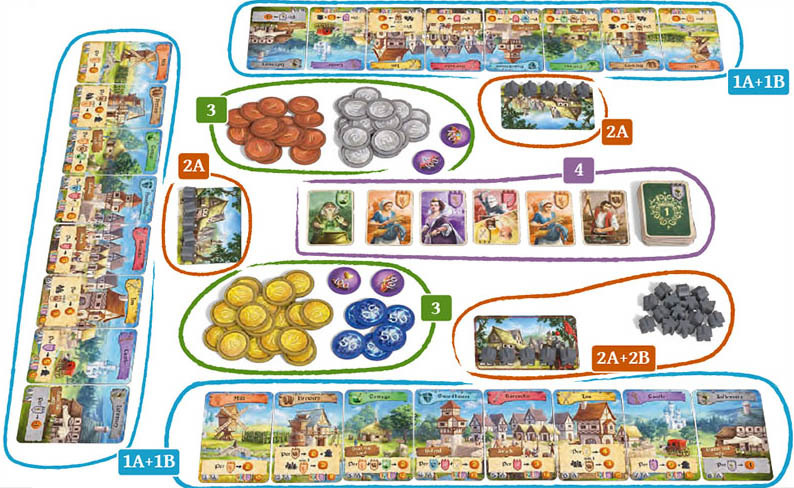 On the bottom-right of each location card is a coin showing that location's value. Each player counts the number of Millers at his or her Mill. Whoever has the most Millers among all players gains points equal to the Mill's value. Repeat this process for each location with a location value. In case of a tie, each tied player gains points equal to that location's value. All players compare points, and the player with the most points wins. In case of a tie, the tied players share victory.